While traveling, food is my raison d’etre. Actually, it’s pretty much how I choose my destination. Amidst the other amazements that Thailand holds, the food is in the top 3. So for me, a trip to Thailand wouldn’t be complete without attempting to learn the secrets of their amazing flavors so I could duplicate them at home. The Thai must know that visitors to their country will have this desire, because there is no lack of Thai cooking classes. The lessons can be had in locations as diverse as the luxury hotels of Bangkok to someone’s home kitchen. Seeking authenticity, my companions and I sought out a local setting for our lesson. 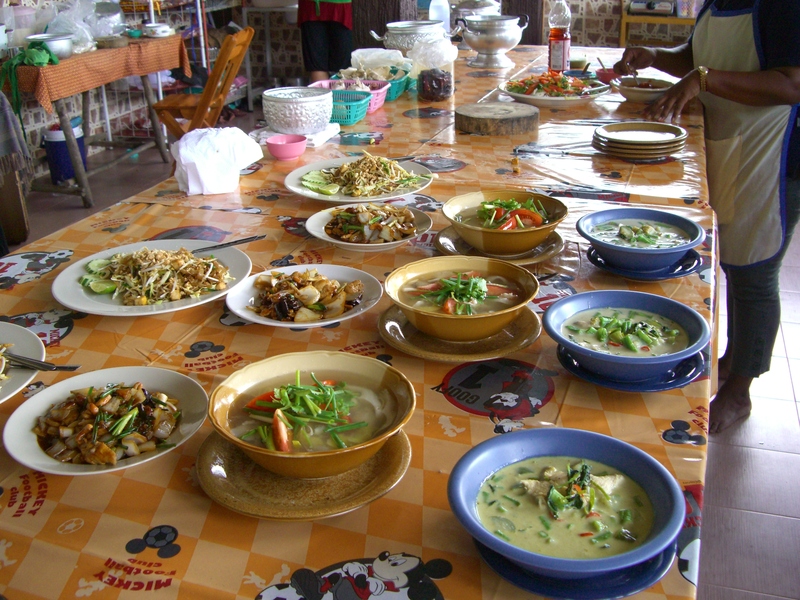 Aonang Thai Cookery located near Ao Nang and Krabi was a fantastic choice. We chose a half-day morning lesson and it was just the 4 of us in the class so we all got lots of hands-on attention, not to mention lots of food! Coordination was simple…we were picked up at our hotel in the morning, driven to an impossibly gorgeous setting partway up a hill with a view of both the surrounding hills and the Andaman Sea and driven back after class was finished. In the between, we learned much about Thai flavors, ingredients and techniques. 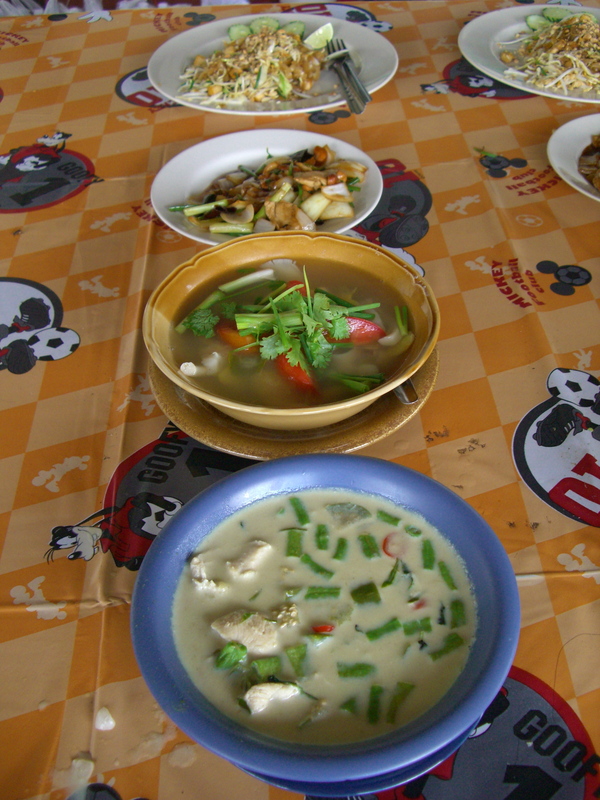 First task was choosing which dishes we’d like to learn to make: for us it was Green Curry Shrimp, Tom Yum Soup, Cashew Chicken and Glass Noodle Salad. Our instructor, Sow, then proceeded to explain in detail the preparation and was immediately at hand for any help needed as we dove right into our cooking. Sow was quite impressed with Anita in our group who kept adding more and more spice to her green curry shrimp…apparently most Americans can’t handle as much as she can! Food cooked, we headed up to the open-air dining area to enjoy our feast. Easily enough food for 4 times as many diners, we nevertheless managed to make quite a dent. I have to say, the food we made rivaled the food we’d been eating in the restaurants and was not as mystical as I’d thought. Basic, fresh ingredients cooked with a minimum of fuss and bother and, voila! As it turns out, since returning home I haven’t often practiced my Thai cooking skills, but I still have the recipe book with my notes. When the urge strikes I’ll be able to revisit that flavorful day in Thailand.